Everyone knows that the folks at In-N-Out love Jesus and print that little Bible verse on all of their cups and things, but what you might not know is it’s not just a front. 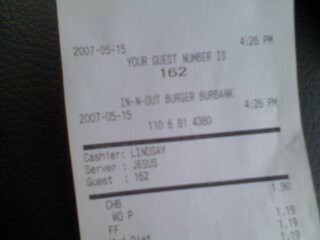 Jesus actually works there, and here’s the receipt from this afternoon to proove it. Though he forgot to include my salt, not very omniscient if you ask me. Hate to break it to you, Bonner, but most of us in California first heard the thigh-slappingly hilarious “pretending to mistake the common Spanish name for the name of the Christian messiah” joke when we were about eight years old. Also, don’t they have little salt packets available where the straws and forks and stuff are? And no matter what Daniel says, I still find it funny from time to time. Last year I worked in Mexico City and my driver was Jesus. I had Jesus on my speed dial. “Gandalf, the Gray” sold me cat food at Trader Joe’s once. I passed the office of a lawyer named Merlin not too long ago. BTW, what the hell is a vegan doing at In-N-Out? You don’t f*** with the Jesus! LMAO! a little sacriledge never hurt anyone, what’s the worst ~ we may not get eternal lawn care?